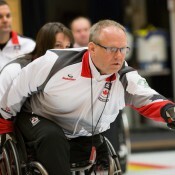 Dennis Thiessen is a three-time national champion, world champion, and Paralympic gold medallist in wheelchair curling. Dennis started in his sport in 2005 when a friend invited him to try wheelchair curling. At the time, Dennis was familiar with curling for able-bodied athletes, but couldn’t see how someone could throw a rock down the ice while in a wheelchair. Today he is one of the top wheelchair curlers in the country. Dennis won bronze in 2008, 2009 and 2010 at Canadian Nationals. In 2011, he became a national wheelchair curling champion (a feat he and his Manitoban teammates repeated in 2013 and again in 2017. After an extensive two-year tryout process, Dennis was named to Team Canada in 2012. As vice-skip for Team Canada, he took a top spot at the 2013 World Championships where he helped lead his team to gold. The event was held in Sochi, Russia, as a test event for the Paralympic Games. The following year, Team Canada captured a gold medal at the 2014 Paralympic Games in Sochi, Russia. Outside of curling, Dennis helped establish the provincial branch of Manitoba Farmers with Disabilities, an organization dedicated to presenting farm safety programs to children, youth and adults. He lost his leg in an accident on his family’s farm when he was seventeen years old.